You see, the Historical Unit had its eyes on three diplomas in the Board Room that needed conservation. “These are the oldest representations of Mayo’s commitment to education and scholarship,” says Matt Dacy, director of Mayo Clinic Heritage Hall. The diplomas are for William Worrall Mayo, M.D. (Medical Department of the University of Missouri in St. Louis, which later became part of Washington University, 1854); William James Mayo, M.D. (University of Michigan, 1883); and Charles Horace Mayo, M.D. (Northwestern University, 1888). “As the old figure of speech for a diploma – 'sheepskin' – implies, these diplomas were printed on natural material vs. paper, and showed significant wear,” Dacy tells us. To get the sheepskins shipshape, the diplomas were sent to the Midwest Art Conservation Center in Minneapolis. “The fun thing is that the staff there used a Mayo-like approach in treating the diplomas,” Dacy says. “Working as an integrated team of specialists, they did an intake/assessment/history of the diplomas and planned a course of care, using highly specialized equipment and painstaking methods.” (They also used surgical scalpels in the process.) “Upon ‘discharge’ (return of the diplomas to Mayo Clinic), they gave the diplomas an excellent prognosis,” Dacy says. The diploma restoration project, led by Renee Ziemer, was a major initiative involving Education leadership and the Historical Unit/Archive as part of the Mayo Clinic Sesquicentennial. It was funded by John T. and Lillian G. Mathews, the founding benefactors of Heritage Hall and many heritage-related projects, including the Heritage Film Series and the mobile exhibit. The team also worked with Mark Flaherty, Media Support Services, to produce a brief video about the restoration process. 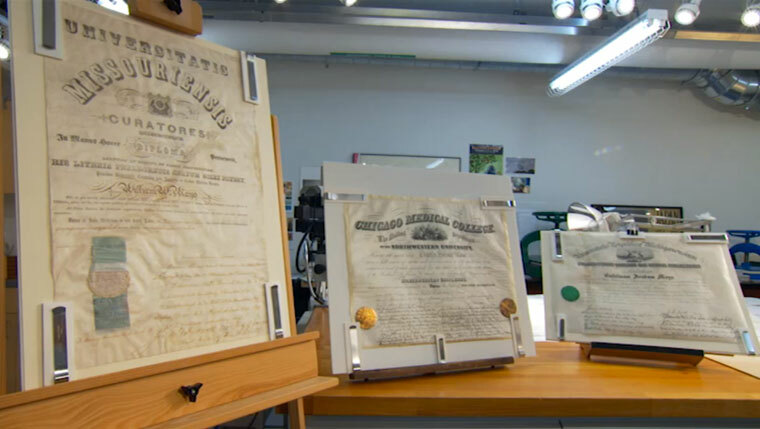 Elizabeth Buschor, senior paper conservator from the Midwest Art Conservation Center, describes the process in exquisite detail and shows off the restored diplomas. “We not only seek to restore the work of art to resemble as closely as possible its original condition, but to do so in a way that is very respectful of the condition of the work of art,” she says. Mark Warner, M.D., Mayo’s executive dean for Education, also offers his stamp of endorsement. Put on a cap (and gown), take a moment to watch the video below and then share your comments. Perhaps, make a little history of your own by sharing this story using the social media tools atop this page.